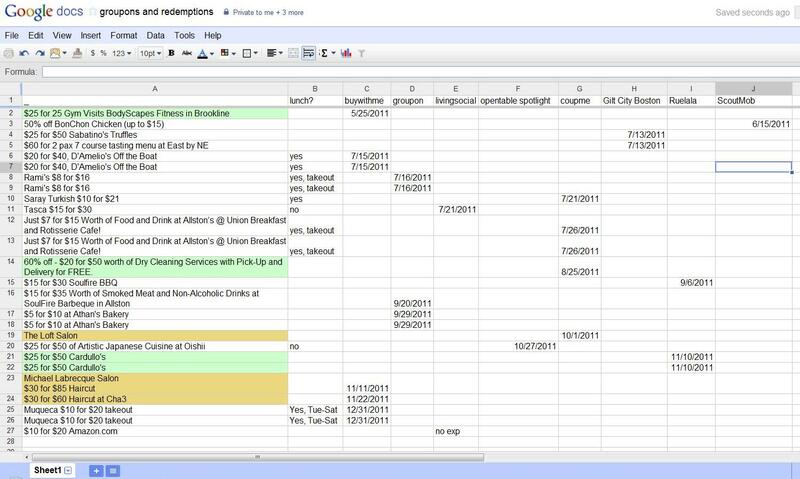 How does an inveterate bargain hunter with book-keeping tendencies keep track of her crazy amounts of vouchers?--Why, using a google spreadsheet of course! Since I might as well be living off my n vouchers, I should seriously consider another blog evaluating what I bought. Besides the sites I use the most (ranked in order) like Buywithme, Groupon, Living Social, there are also Coupme, Opentable Spotlight, Gilt City Boston, Rue La La and mediocre ones like Tippr (deal didn't work and they finally refunded my purchase after months of followup) and Wow What Savings (uninteresting, in the surburbs, crappy deals, emails-only referral). I recently discovered Scoutmob, and so far I really liked their site interface. What I'm sold on and highly recommend is that their deals can be sent as simple text messages. This deal format eliminates the need for paper printouts and doesn't discriminate against my phone's level of intelligence. Yes, I'm still using a dumb phone (as opposed to a smart phone) so no apps for me :) Bonus: I scored this fabulous free discount coupon for BonChon Chicken. My friend Eric is launching Boston Deal Ninja next week so I'm looking forward to more deals that would allow me to live life large on a shoestring budget. Speaking of budget, the column named "Lunch?" also reminds me that I could also stretch my vouchers on cheaper mid-day meals instead of dinner. w00t! Seriously. I've got fitness (#2), shopping (#27), haircuts and grooming (#19, #23-25), laundry and dry-cleaning (#14), gourmet food supplies (#4, #21-22) taken care off. Not surprisingly, the remaining 16 left pertain to food. And hence more fodder for this blog. *Update: Right after I posted this, Ajay recommended an app called City Pockets which provides email reminders and imports vouchers easily (no sharing of voucher inventory with friends though-score 1 for spreadsheet). The folks at CP are still in the process of adding more providers so their list is incomplete (darn) but the absolute highlight is their Marketplace feature which allows you to sell your unused vouchers. Genius! Who hasn't let their vouchers go to waste before/ sold them for less on craigslist? I'll definitely be signing up....although I find it both funny and tragic how a prevailing app phased out my oldskool spreadsheet overnight...pretty, color coded tables and boxes, anyone?